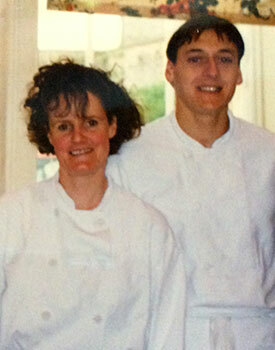 Clive Gawlik has been working in the catering industry for 25 years. He started out in Williams Kitchens' delicatessen and restaurant and from that the outside catering business was developed and established as the leading catering company in the Cotswolds. Clive was a pivotal part of the operation, taking responsibility for ordering the finest ingredients to providing service for the events. He ran an extremely slick performance, ensuring the food arrived immaculately at the tables, with consistently excellent presentation at all levels. His determined passion for producing the highest standards has never dwindled and he is renowned for his standards of excellent catering in Gloucestershire, Herefordshire, the Cotswolds and beyond. It was during this time that Clive became hounded by a fairly persistent client over the fish slab. She was reputed in the shop to be the best account customer with discerning high standards. This person was Emma, who eventually landed her catch, by hooking Clive and the pair became engaged and then married. A partnership that has given them a happy family as well as an outstanding business reputation. Starting in the mid 1980's at a salmon fishing lodge in the outer Hebrides, Emma began to develop her career as a first rate freelance cook. She was snapped up by a prestigious catering agency and was sent to some far flung places to cook for their valued clients. Russia being one particular place where she cooked more salmon than she can remember, but she does recall being sent to cook at a venue in the Pana peninsula in a very dodgy Russian helicopter. Emma then spent three years cooking at Burghley House, home of the horse trials, and also spent many seasons cooking on a grouse moor in Co Durham. 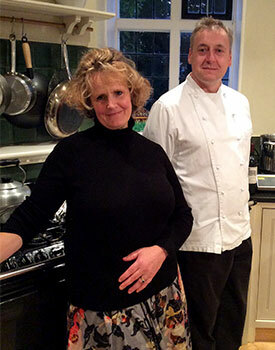 Between the two of them Emma and Clive have an illustrious list of people who've eaten their beautiful food; from her Royal Highness the Queen right on through to Madonna, the infamous queen of pop! Their list of their prestigious and famous clients is extraordinary and endless.